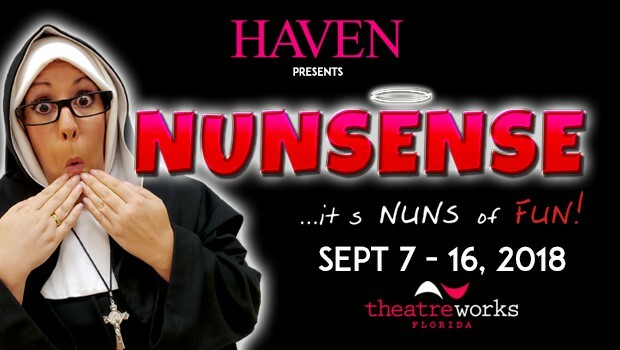 Nunsense follows the crazy antics of five nuns from the Little Sisters of Hoboken convent. When their cook accidentally serves up some tainted soup, 52 of the sisters are poisoned and die, leaving only five living nuns who were not at home the day of the toxic meal. When the convent’s first in charge, Reverend Mother Regina, splurges on a plasma TV, the sisters find themselves strapped for cash, as they still have four dead nuns to bury (whose bodies are being stored in the kitchen freezer!). The nuns decide to put on a benefit performance of the musical Grease in order to raise the rest of the money before the health department discovers their secret! Nunsense single show tickets on sale July 30, 2018. Please check back here for online ticket link. NUNSENSE is presented by special arrangement with Samuel French Plays.